It is not every day that you get to travel to the beautiful land of Croatia along side some of the top rowers from the UK, and across the globe. However, this was not to be every day, nor every weekend for that matter, this was to be a once in a lifetime experience. Sail Croatia is penned to be a fabulous success, headed by Sydney Olympic Gold Medallist Luka Grubor, the man behind the very reason that the Oxford and Cambridge rowing teams would be battling it out once more. This time they would ditch the Thames and instead head for the beautiful waters of Split.The atmosphere was electric, from the training, to the actual setting down on the water. Rivalry between the two famous teams is marked in the pages of history, and it was for this reason that it is unusual to see the two teams compete outside of the legendary annual boat race. Grubor decided otherwise. The occasion was the annual national university and college regatta, hosted in unison with celebrations for Saint Duje - Splits patron saint. 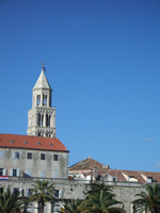 Another cause for celebration was the fact that Split was celebrating 1700 years of being a city. The waterfront was amuck with revellers, toasting the town and the saint that watched over. On this day he must have been smiling. The weather was perfect - the sun sat high in the sky as the boats bobbed merrily in the water. However, the tension still sat high above the rowers. Breaking Travel News: What is it that sets Sail Croatia apart from other similar outfits in the country? Luka Grubor: We’re a U.K company that operates in Croatia and actually owns its own fleet in the Split area. This means that unlike a number of Yacht charter agencies in the U.K we have control over our product and when you go on a Sail Croatia holiday, its our staff greeting you at the airport and our skippers taking care of you during your holiday. This in itself enables us to have the flexibility to respond to the needs of our customers, as we are our own supplier. At the other end of the market (e.g. flotillas etc) there are a few larger operators which manage fleets in Croatia and our point of difference is creating individual holidays and routes for our guests, while offering them a range of activities “off the boat”. These activities might include diving, hiking, vineyard visits, exclusive restaurant visits etc. Overall we’re the only U.K company which exclusively specialises in yachting holidays in Croatia, and our job is to stay at the forefront of the latest places of interest in the destination, so we can reveal these off the beaten track attractions which can’t be found in any guide book. Do you feel that you can cater for most requests - i.e. example scenario - A customer comes to you with a request for a long weekend of sailing and diving. All are advanced divers and all enjoy good food - what would you suggest? We do cater for most requests, and in the example you’ve given, without knowing more about the personalities involved, I would suggest 3 dive sites on Vis, Brac and Korcula. Between them, these islands comprise a huge variety of dives, from drop-offs, caves and caverns, shipwrecks archeological sites and protected submarine areas. All of the dive sites are affiliated centres of ours and any of the trips can be plugged into a sailing itinerary either from the U.K or on the spot in Croatia. Our partners will visit your yacht with all the necessary equipment and take you to the dive sites with their powerboats. With regard to food, and bearing in mind the islands I have suggested, my recommendation would be to definitely make room for a 13 course meal in Vis town, with the option of arranging visits to some more remote restaurants accessible only by boat, both on Vis and Hvar. If the group get the taste for this style of Croatian cuisine, I would recommend exploring the mountains of Brac Island and the village of Gornji Humac, from Bol, which is the base of one of the dive centres. You will be taken to and from the restaurant by van and left to experience a remote island village, traditional cooking methods and a great view, in a setting not commonly frequented by the ordinary tourist. It’s worth noting that long weekends can be tough to arrange in the peak season, due to availability and mainly flight access. Also 3 days is very little time to experience the area fully. We are experimenting with much more flexible offerings, and are providing one day charter trips for the guests of Hidden Croatia (www.hiddencroatia.com), our partners in land based accommodation. How did you devise the concept of sail Croatia? The concept came about from a very simple situation. A couple of years ago, the publicity with regard to Croatia skyrocketed in the U.K. This meant that pretty much every week someone would be asking me about the best places to go or the best place to see the country and the coast, as they knew I was born there and spent most of my childhood in Croatia. I had also spent the best part of 15 years sailing in the area, and felt that the press coverage Croatia was receiving, although very positive, hadn’t really scratched the surface of what really made the place different to the rest of the Med. I have to say that Sail Croatia isn’t a marketing concept or pure business idea. In the end it’s a very simple concept. Myself and my friend and co-founder of Sail Croatia, Ognjen Cato, wanted to show people our favourite places, most of them happened to be on the islands, and we decided that the best way to see them was with your own yacht, which, again, was out favourite mode of transport. What are you aspirations for the company? Our first aspirations are to ensure that every client of ours this summer, has memories for life, in the places they visited and the people they met. I would also like them to feel like they’ve been away for far longer than the time actually spent in Croatia, and have a changed and hopefully positive perception of the country. I would feel a great deal of satisfaction if we could achieve this. As for our long-term plans, our aspirations are to expand into every area that forms part of the experience of Croatia. This means increasing and improving our fleet, forming closer partnerships with restaurants, local businesses, hotels, airlines etc. We’ve never been a pure yachting company, our main goal is to reveal the best of the destination in a certain way, so it is likely that we will be aiming to provide a rounded experience of Croatia. A dream would be to have a Sail Croatia resort, with our own marina base and airport, built in the most environmentally friendly way possible, open to all that can appreciate the Croatia we know and love. Would you ever consider expanding outside of Croatia? In a word, no. Sail Croatia would be hard to scale in that way as we have invested our lives into getting to know the destination. It’s unlikely that we would be able to claim that we know Turkey, Greece, Spain, as well as Croatia. I doubt we will ever turn into a huge company, with a multinational base, but we are likely to try and expand into different areas within Croatian tourism, as I mentioned earlier. That’s not to say that I don’t have a passion for other places and destinations, but I’m not sure that we could make a business out of it through Sail Croatia. Are you finally realising a long set dream? I appreciate the question, but unfortunately “living the dream” is not a phrase that immediately springs to mind when trying to get a fledgling business on its feet. I have total belief in what we are doing at Sail Croatia, and can see a vision of what it would mean to succeed in the long term. Having said that the lifestyle of running a business can be quite lonely, especially when trying to do something new. It seems that there are lots of volunteers out there who are happy to tell you why it won’t work, and we’re the kind of personalities that keep our head down until the job is done, and aren’t particularly good at accepting that there’s something we can’t do. We haven’t come close to realising our goals, but we do appreciate the fact that we’re on our way, and that we have a chance, and try to keep reminding ourselves that its our own choice to be here, and no one made us do it. With many thanks to Luka Grubor. Also with thanks to the Oxford and Cambridge rowing teams.